You've Got About 5 Seconds to Hook Girls With Your Profile! Otherwise, You're Toast! But Today, I'm Going to Show You How a Few Simple Tweaks Can Turn You Into a MAGNET for the Most BEAUTIFUL Women Online! You Know What I LOVE About Online Dating? It's like Amazon.com, except I call it WOMANazon.com, because that's what it is. It's like shopping for a t-shirt or a car stereo. You have your pick of the litter. Literally THOUSANDS of women are at your fingertips. If you don't like the look or attitude of one woman, that's fine, because there are so many others too choose from. It's like Amazon.com for WOMEN, too. They shop on MANazon.com, and they have literally THOUSANDS upon THOUSANDS of men vying for their attention. And, for better or for worse, that's made women these days EXTREMELY fickle. If there's one thing off about your profile, you're toast. Goodybe. She doesn't even remember you five minutes from now. Dating Apps & Online Dating So Quickly! Because it's so f*cking hard to GET and MAINTAIN a girl's attention! I know from not only personal experience, but also the experience of the thousands of guys I've coached, how frustrating online dating can be. Sorry to be harsh, but listen: It's OKAY. And that's why so many guys make the same mistakes in their profiles over and over again without even realizing it. Here are just some of a few of the most common offenders. Are You Guilty of Any of the Following...? The Douchebag Profile: Are your profile pictures photos of you shirtless, flexing in front of the mirror? Are you shown drinking beers with your buddies? These set off INSTANT "douche" alerts in the minds of quality women! The TMI Profile: Is your profile 10,000 words long? Do you go into all the intimate details of your life, what you're into, and what your interests are? You're giving away WAY too much information, and beautiful women looking for you online feel overwhelmed! 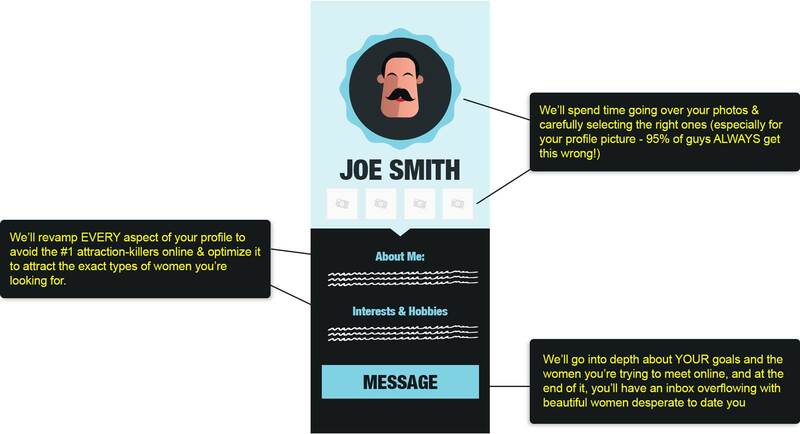 The "Mr. Boring" Profile: Then there's the opposite... Is your profile WAY too short? Do you BARELY give any information about yourself? How are women supposed to message you and show interest in you if they've got nothing to go on!? The Angry Profile: Do you mention your ex and how much your heart was broken? Or, does your profile mention politics or religion, or say anything like, "If you voted for Trump, don't message me?" 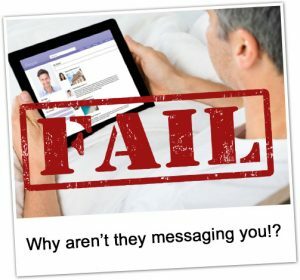 Well, that's why they're not messaging you! You see, online dating is a big part of my business – and I know it better than any expert in the business. That is not meant to brag or sound egotistical. 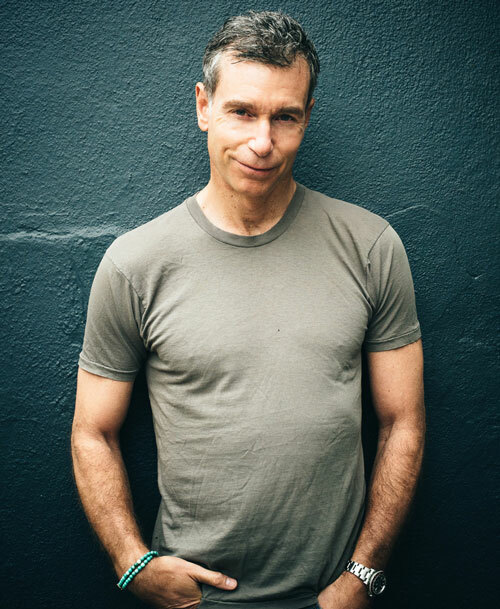 It is simply that, after being the go-to online dating expert for thousands of magazines, radio shows, and newspapers — and coaching both men and women in online dating for more than two decades — I have seen literally THOUSANDS of online profiles. Ive seen pretty much every type of online dater that there is — the good, the bad, and the ugly. Because of all this, I know without a doubt that I can address ANY online dating problems you've had and show you how to conquer them. "In 2 Hours You Changed Everything!" I was online dating with almost no success. I messaged women and not a single one messaged me back in 2 years. David took one look at my profile and with a few minor changes that I would have never thought of and all of the sudden, I had an inbox of 15 women messaging me. Its amazing I was spinning my wheels for so long and in 2 hours David changed everything. Thanks and next time you are in New York PLEASE let me buy you dinner or something man! ...because remember: Dating online means YOU get YOUR pick of literally all the women out there. You could actually have the world's most beautiful women right at your fingertips. Just imagine having a profile picture that's GUARANTEED to make you look interesting, attractive, and be a perfect "icebreaker." Imagine being able to log into Tinder or Bumble every night and see that you have 20 new matches waiting for you. Imagine having a profile on OK Cupid, POF, Match.com or ANY other dating site that's been scientifically designed so your inbox is always overflowing with messages from gorgeous women! "I Thought Tinder Was Such B.S. Until You Showed Me Different"
Thanks to you, I not only had a huge increase in confidence and knowing what REALLY attracts women, but I now actually get dates off Tinder. I thought Tinder was such B.S. until you showed me different. Now I've got a game plan that's helped me get so many numbers. I think I'm gonna try J Swipe at some point, and I know EXACTLY what to do on there thanks to you! From Tinder & Bumble to OK Cupid, Match.com & More! "The Responses I Have Had From Women Has Been Amazing!" Just wanted to let you know that since I've worked with you the response I have had from women has been amazing! Check out the message I got from this woman … A couple of messages have been sent back and forth and I’m meeting her on Thursday! You will get a personal, one-on-one consultation with my coaches and me through a series of emails so I can get to know you, your goals, your lifestyle, and your dating situation. I’ll even have one of my leading coaches call you and talk to you personally to get a feel for who YOU really are. Including selecting the photographs that will be used on your profile. I will create an online profile from top to bottom for you that not only reflects who you are, but will also effectively attract the EXACT kind of women you want to meet. Live with your new profile for a few days. I not only want your profile to be really good – I also want YOU to really love it as well. So if you see something you’d like to tweak or add here and there, I’ll make those revisions for you. As part of this package, we’ll take your Tinder and Bumble profiles and transform them too. Tinder and sites like it are very different to your Match.com, and require a different approach. Once I’m finished with your profiles, you’ll have an inbox full of messages from GORGEOUS women — the kind of women you've always seen online and wondered, "How can I date a girl like that?" Well, I will give you ALL the tools you need to attract THAT girl online. I will give you the magnetic profile that will truly make ANY online dating site or dating app YOUR personal buffet of the world's most beautiful women. So what do you say? Are you ready to totally revamp your online dating experience? Then click the button below & let's get started. "I Woke Up This Morning With 50 Matches From Really Cute Girls on Tinder!!!" Dude! I woke up this morning with 50 matches from really cute girls on Tinder!!! Working with you has been so eye-opening and your approach is really great. It's like you've got this down to a science. How long have you been doing this? "I Can’t Begin To Tell You How Great The Last Month Has Been!" David, thanks for this. Hearing you breaking down everything has been amazing. I can’t begin to tell you how great the last month has been. 25 dates all from Match and POF. Before the program I had 2 dates over the last 3 years.